This recipe was featured as a USA Today Super Bowl recipe many moons ago. I give all credit to a friend’s mother for introducing me to liquor and red meat, and something other than traditional cuts of steak. The acid in the Soy and Sherry tenderize this beautiful cut, and the garlic overtones create a one-of-kind flavor. It’s great served with risotto or mashed potatoes. Per Piece of Flank – approx. 1.5 to 2 Lbs. With a sharp butcher knife, trim the steak of any irregularities, and then score each side of flank 1cm deep on both sides of the flank. 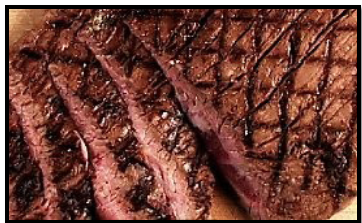 With your sharpest knife, carve flank steak into thin slices against the grain at a 45 degree angle as shown above, then drizzle marinade overtop, or place all slices of flank into a vessel filled with the marinade. Suggestion, dress up the marinade up by cutting up some chopped portabella mushroom and throwing them in while marinade is boiling. Serve with sauce over your flank steak. Best served obviously with a fortified bevie, i.e. port or sherry.